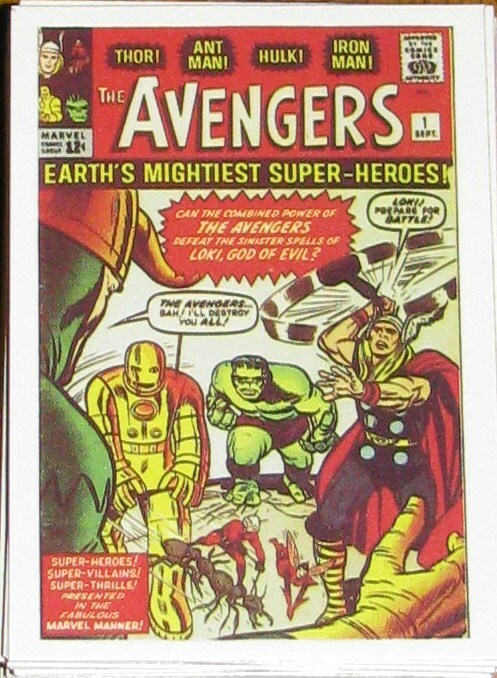 The card above here is from the Silver Age series. It’s one of the chase cards and it’s pretty hard to find. 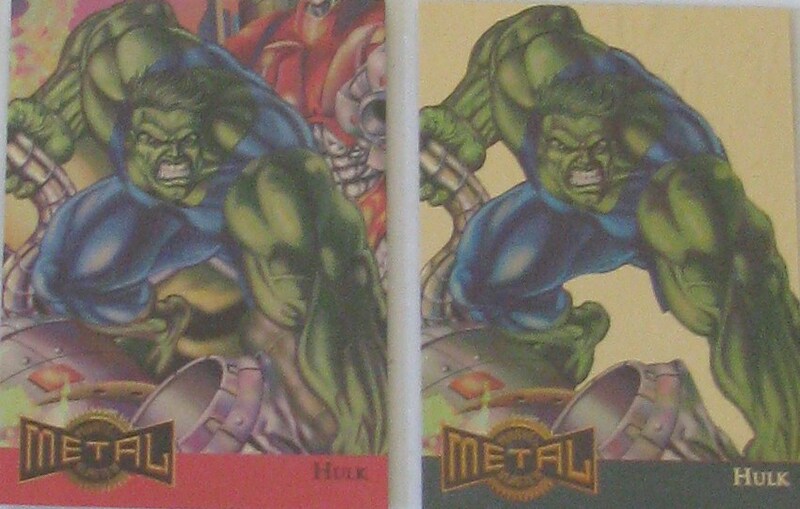 The Metal cards below came in a few versions – these are the Gold and Rainbow version…. That’s it for about now – I think I will be able to finish this “Cards” theme by next week. And even better – I am planning on a really special Ultra-Rare month next month showcasing some of the most unique and extremely rare pieces in the collection! I found a box of this set on the Cape. 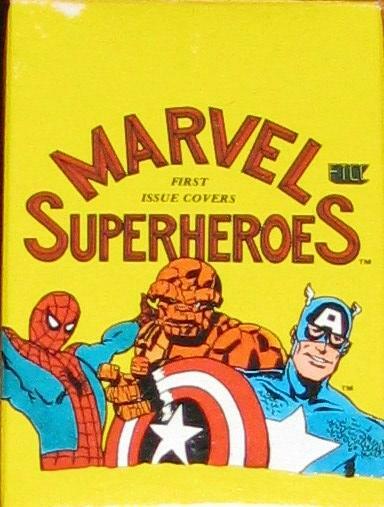 It’s a pretty fantastic idea of collecting just covers to the #1 issues. 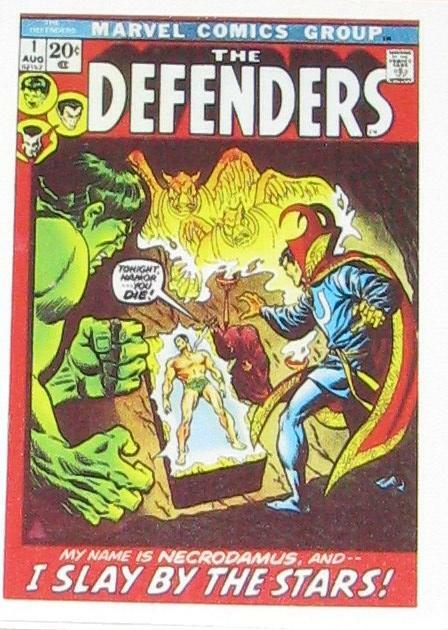 So, of course we have The Incredible Hulk #1 and Avengers #1 – also both first appearances of the Defenders – Defenders #1 and Marvel Feature Presents #1 (Yes Gary, I know – that’s not the correct title) but also the Marvel Premiere Featuring #1. 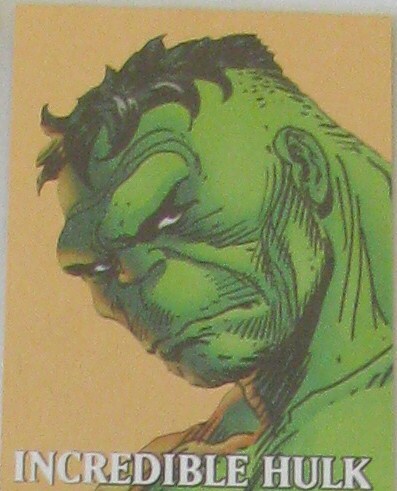 It’s interesting to me when these supergroups form they want the Hulk to be part of it, and why? It’s obvious really – he is the powerhouse you want on your side when things get hairy! 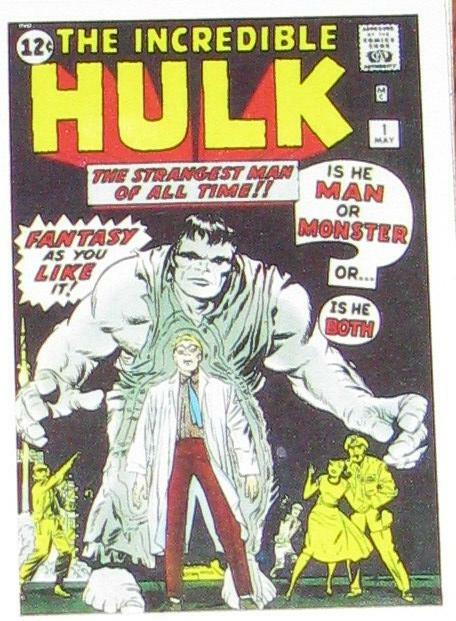 But the real point is – the Hulk can’t be controlled – can’t be part of a team… yet they won’t stop having him join! Anyways, this is a great set – everyone should seek one out! 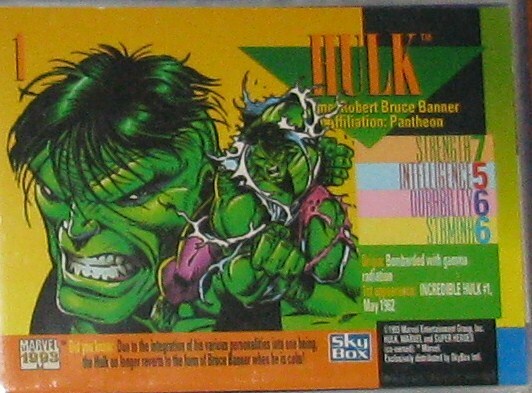 This set – released at the same time as the Hulk movie set – is one of my favorite sets! 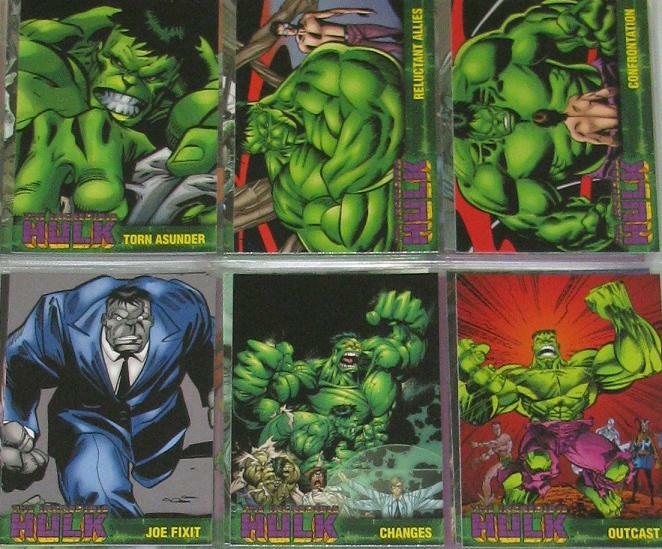 The images on the cards cover a lot of artists and span the Hulk’s history. 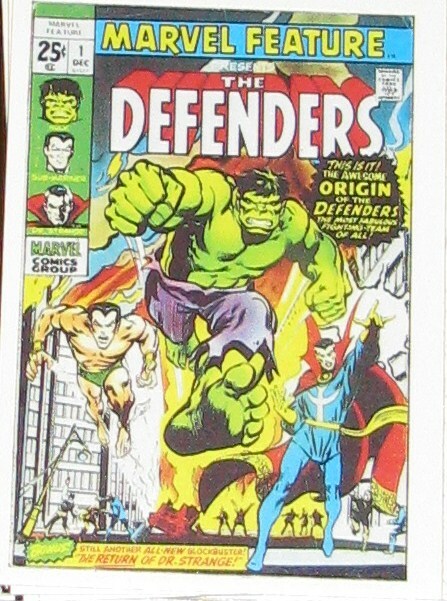 Byrne, Garney, Keown, Kubert and Larsen – and some of the most classic covers are in this set. 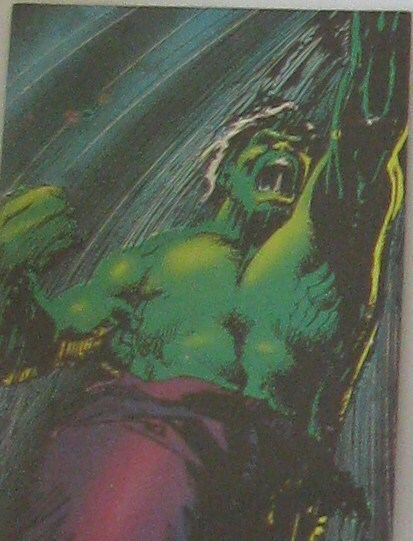 A lot of the images from the 70’s Hulk magazine also find their way into this set. 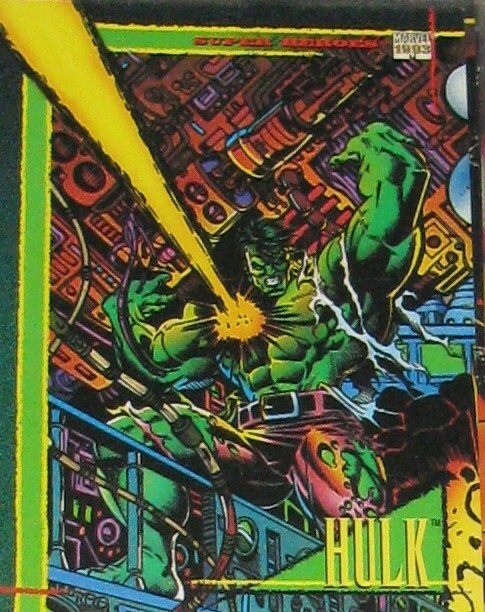 If you don’t have that series – it strarted out as Rampaging Hulk and then turned into the Hulk – you should pick it up, even for the artwork alone! This is an impressive base set – but the chase cards are even better! I really like the 2 chase sets – and one of mine is still incomplete, if you can believe that! I will talk about that set first. 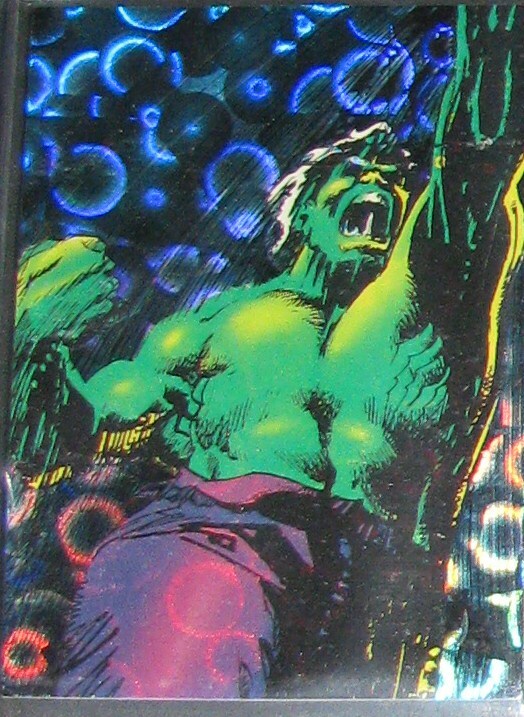 They are called the Gamma Ray chase cards – and each card has an image of the Hulk behind a shiny green backround. These are great – the only problem is – they aren’t easy to find! 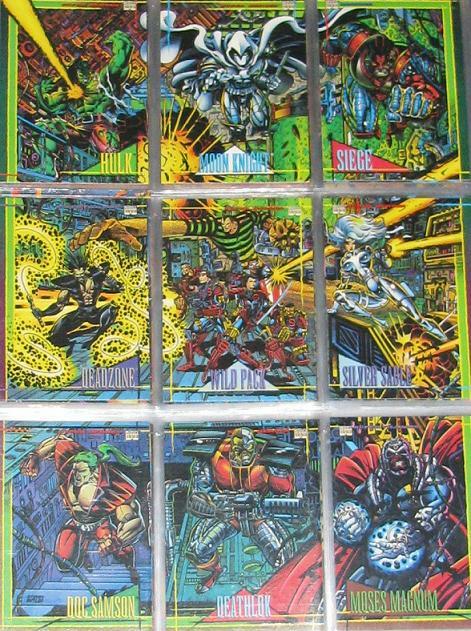 These is one set on ebay – but all I am missing is #7 – and I can’t find it ANYWHERE! If anyone has it I would be willing to trade or whatever. 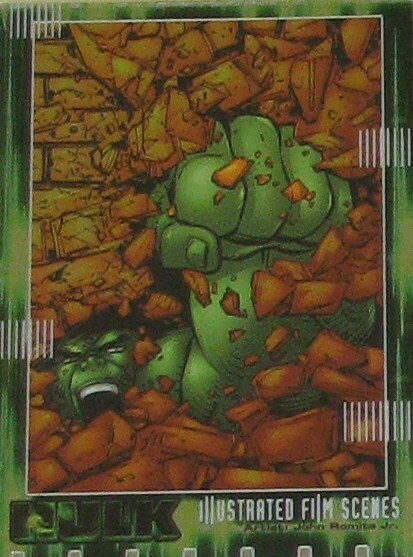 In fact, I have a few extra of the next set right here – the Crystal Clear Hulk set – this has some of the most classic images from the Hulk ever – that encapsulate most of the card – the edges are green brick and other than that it’s see-through. 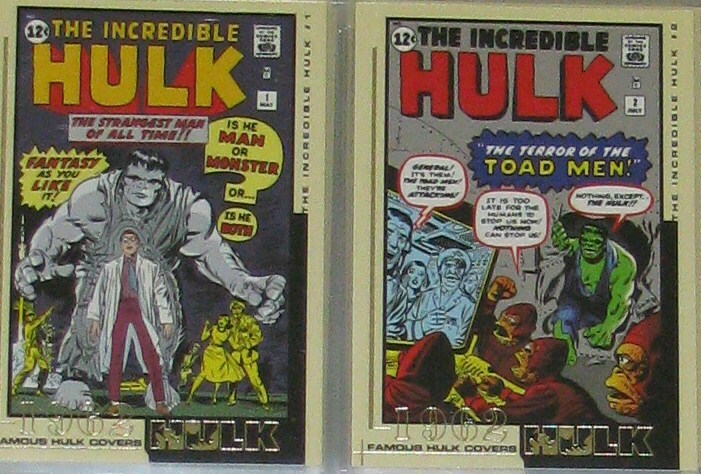 This was a hard set to complete – I had #1 and #4 – and then found a #2 – I was looking for #3 and #5 for a good price when I was lucky enough to snag an entire set from a international seller for about $5.00! 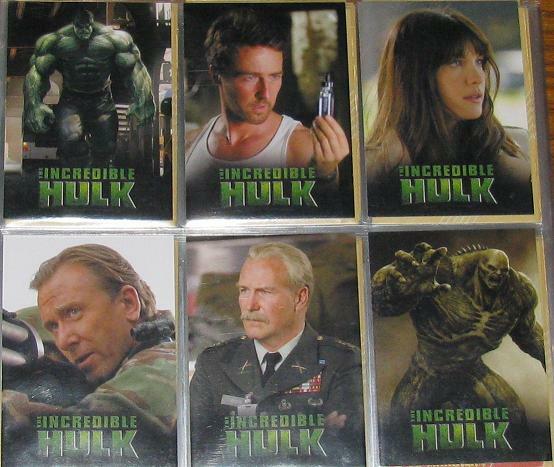 This here is just a 6 card set that has all of the actors in their roles and a Hulk and Abomination card. The set is very limited to only 999 – I found this set at New England Comics in Quincy. 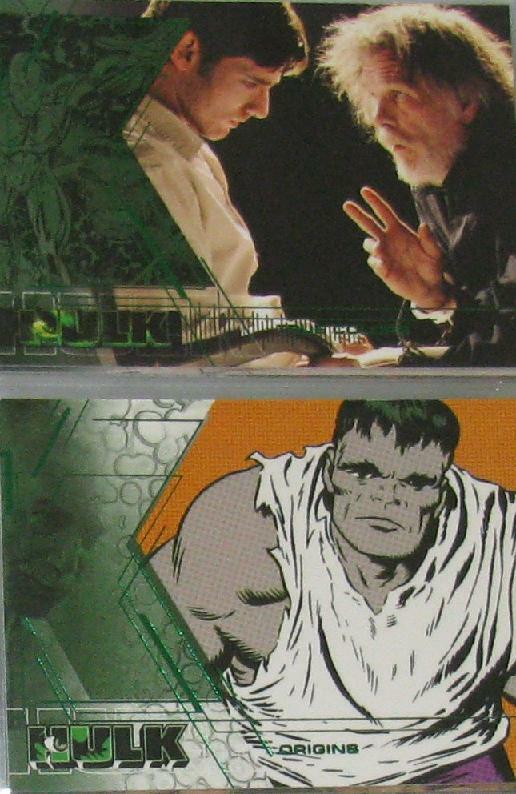 I was bummed that they didn’t make a full set movie cards for this movie – but this is at least something! Each card has the actor’s name on the back and who they played in the movie. I’ve never seen this set anywhere else and I am not really sure where it comes from – but if anyone knows I would be thankful for the info! Come on back tomorrow! I will be taking a break from the all the cards and reviewing… oh – that would be cheating – you have to come back tomorrow! This was a fun set to collect. 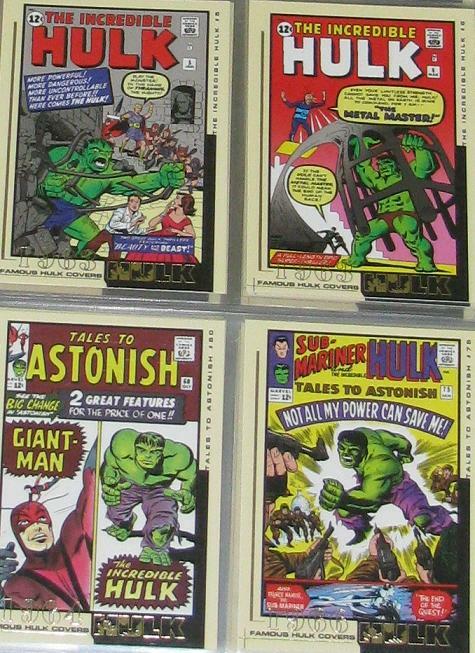 I remember this set being one of the first sets that I tried to get every card – remember, these other sets I have were given to me – even the Marvel Masterpieces that I collected – I never really tried to collect the whole series. I just got what I got. But this set was one where I actually continued to buy packages to try to get the cards I needed. Of course, that left me with several incomplete sets – missing just a card or two – also missing a few of the chase cards. ... and the Big Guy! 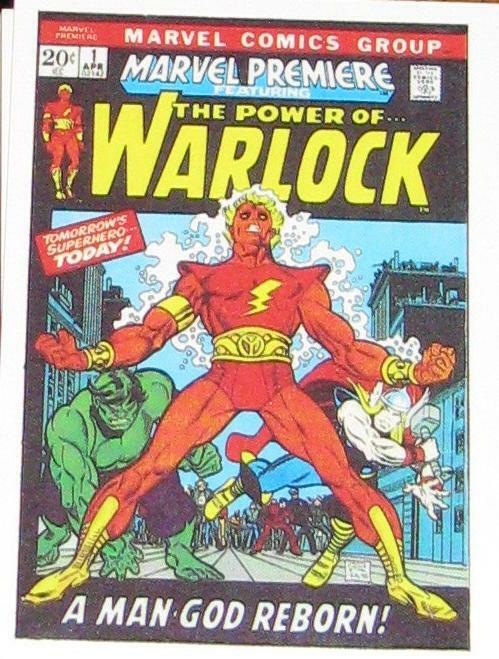 I went into Larry’s Comics and saw they had 2 whole boxes – so I haggled for one of the boxes down to a price we both were happy with – and I went to town ripping these packages open trying to find the few missing cards I needed. I needed base card #35 – got it. Base card #50 – got it. 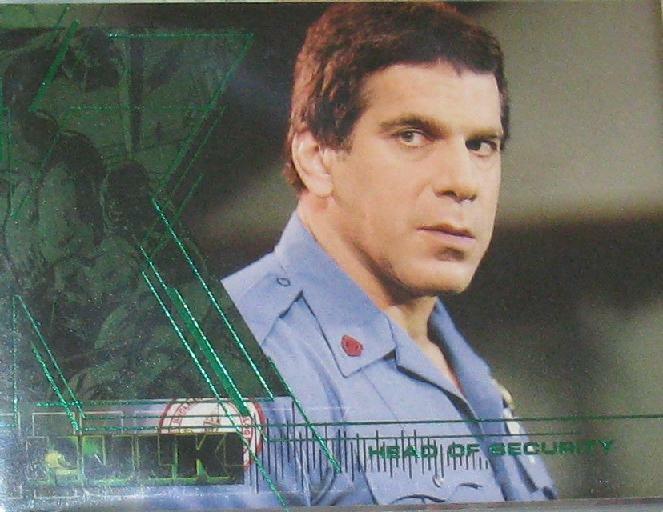 I needed chase card, Illustrated Film Scene, #3 -got it – and needed chase card #10 – DIDN’T get it. 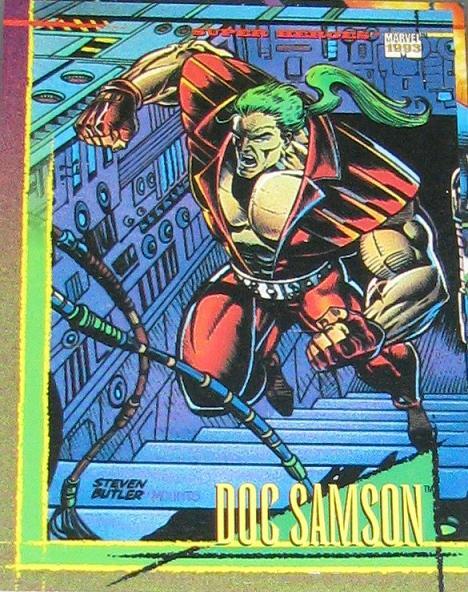 I also had every famous cover card – except for #10 – and I didn’t get that either. I was fuming! I only needed a few cards to complete the set – so to ebay I turned. 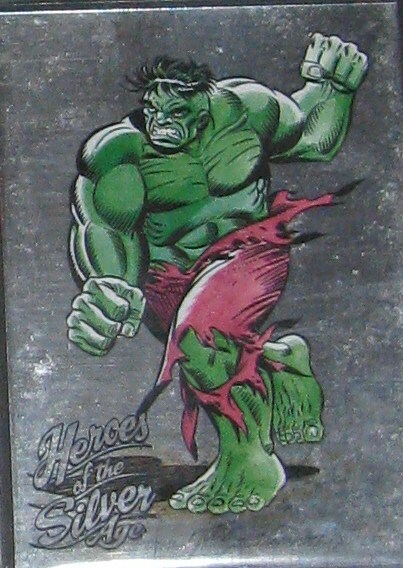 I was able to get the Illustrated Film Scene #10 – but the famous covers #10 was impossible to find! 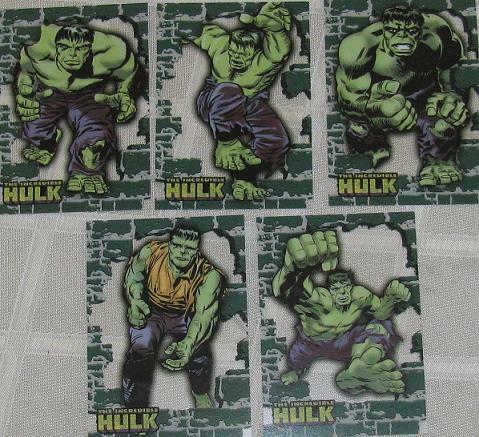 Unless I wanted to pay $30 for the entire set and have another ALMOST complete set of these… so I waited. I have told the followers of this blog many times about patience… and this is yet ANOTHER story where it worked out. 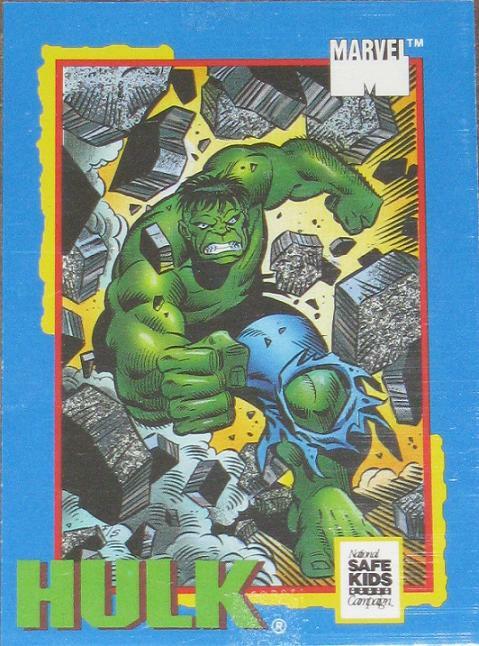 I continued to browse ebay – and then one day I found an international seller – selling the exact card I needed – but he listed it under the year the comic featured on the card came out! And there it was! $2.00 later it was all mine! Anyways, great set – worth picking up! 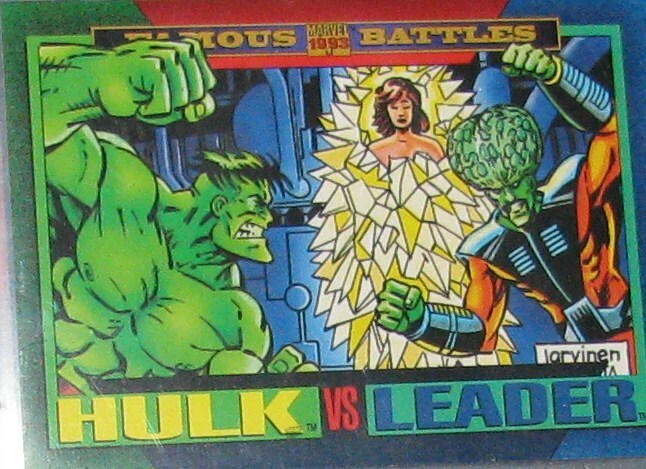 I loved how the base set had both movie and comic images. Again, this set is worth picking up! And it’s actually pretty easy to snag off ebay for a pretty nice price – not like I did, the old fashion way, which cost me a fortune! They did something REAL interesting for this set. 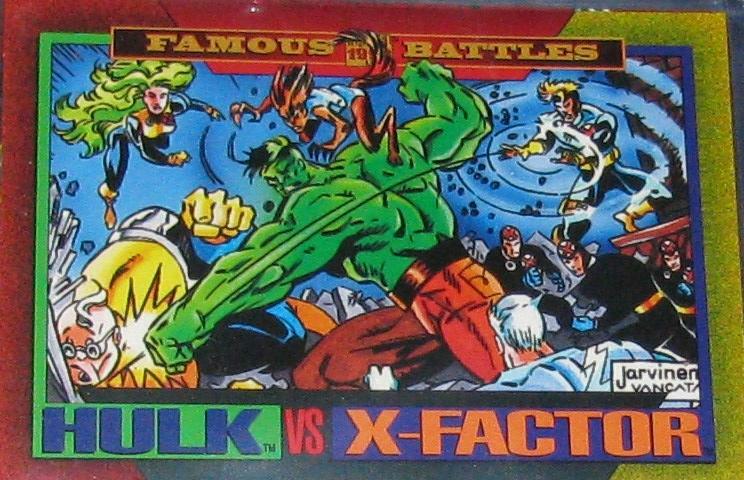 While each character still had their own card – they made it so that each 9 cards made up a bigger scene together. 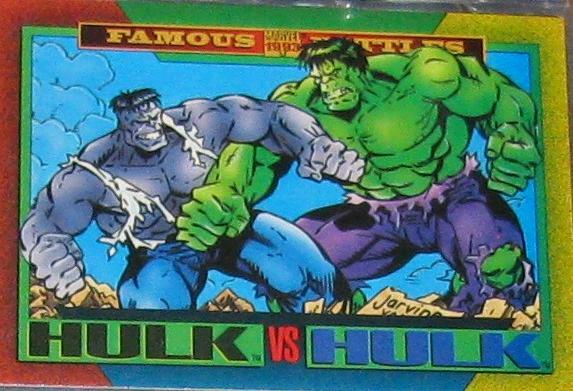 Hulk takes the #1 position in this set as well – just like in 1993’s Marvel Masterpieces… kind of odd… but Samson also gets his first spot in a card set as well! 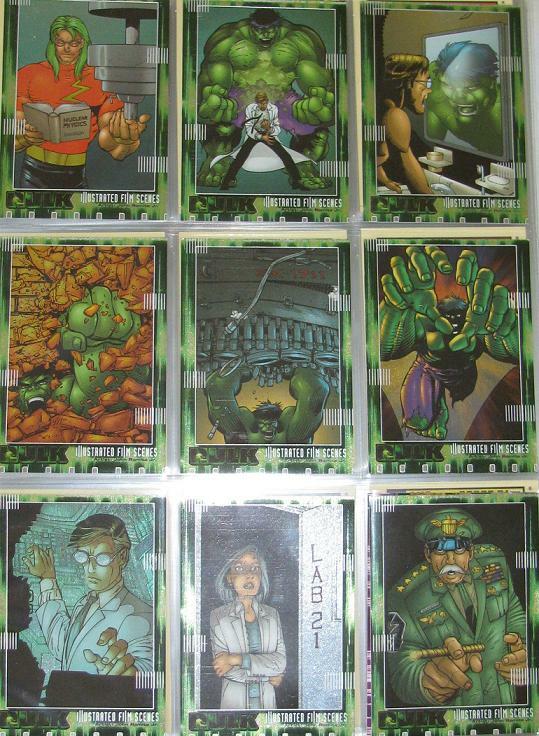 While I do have this whole set and am not looking for any – I do have a couple extra 2099 chase cards – if anyone out there need them. Email me and we’ll talk! Maybe you have something I need! Next up?!? 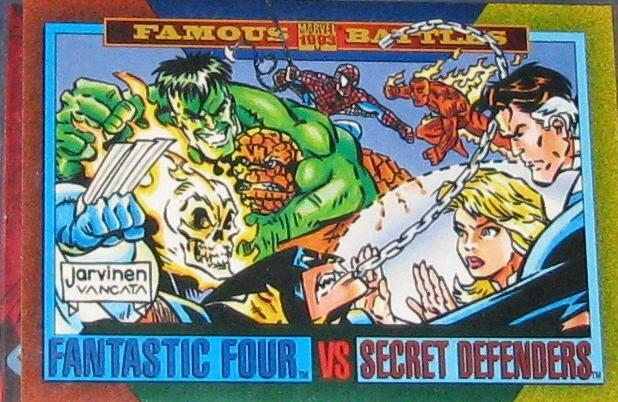 Ummm… the new Marvel Masterpieces? I’m not sure – I’ll have to look and see what I have posted and what I have left!